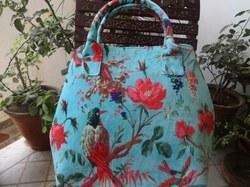 - A Vibrant Handmade Velvet Hand Bag. Made on imported quality velvet fabric with stylish shape hand work buta adorned on the front. It has a golden color lace adorned on the top as well as on the belt. We are among the top manufacture and exporter of a wide collection of Velvet Drawstring Bags. Our beautifully made drawstring bags are ideal for keeping various pieces of belongings to keep them safe and organize. 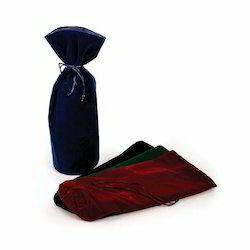 These drawstrings bags are made from superior grade velvet fabric crafted to provide elegant and beautiful pouch. We are instrumental in offering a wide gamut of Promotional Velvet Bags to our clients, in varied specifications so as to meet their exact requirements. These promotional velvet bags are manufactured using supreme quality raw material procured from reliable sources of the industry. - Cutting down velvet sheets sewed into required sizes shape etc. A feminine velvet bag available in contrasting color combinations. The straps of the bag are perfect to throw over the shoulders or carry in hand, perfect for everyday activities. In order to keep pace with never ending demands of clients, our company offers Velvet Bag. size a : 4" x 3"